By Thomas McNemar , M.D. Thomas McNemar, M.D., Mitchel D. Krieger, M.D., John LoMonaco, M.D. Thinking about Body Contouring Surgery? If you’ve lost a dramatic amount of weight, you are no doubt thrilled with your accomplishment. However, you may be disappointed that you still have a problem—loose skin that will not respond to diet or exercise. If you’re in this situation, bariatric plastic surgery may be a solution. This cosmetic surgery removes the excess skin and restores more natural-looking body contours. 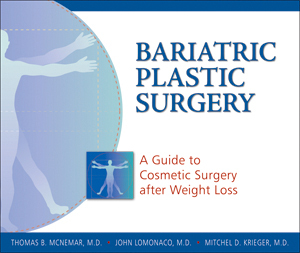 The book contains 100 before-and-after photos of patients who have undergone these bariatric plastic surgery procedures. Illustrations show incision placement and resulting scars for each procedure.